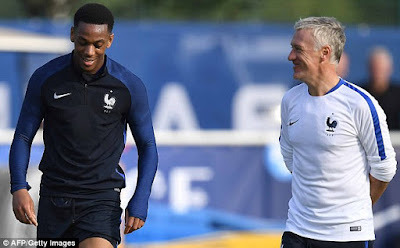 France national team coach, Didier Deschamps hopes on-form Manchester United winger/striker, Anthony Martial maintains consistency in the wake of his recent outstanding outings with the Red Devils. Martial has found form for the Old Trafford outfits, finding the back of the net five times in his past six games earned him a recall to the France national squad. Deschamps hopes the 22-year-old is maturing, tasking the forward to maintain keep improving form. "Anthony has been with the national team for a while now. He's experienced both good and bad times, which is also the case for his club," he told a news conference. "What he's currently achieving with Manchester United is closer to what he's able to do regularly. I'm talking about commitment and efficiency in front of goal." "He's a young player and I hope he is becoming more mature. He has proved that on the pitch by how important he's been for Manchester United for a few weeks already." 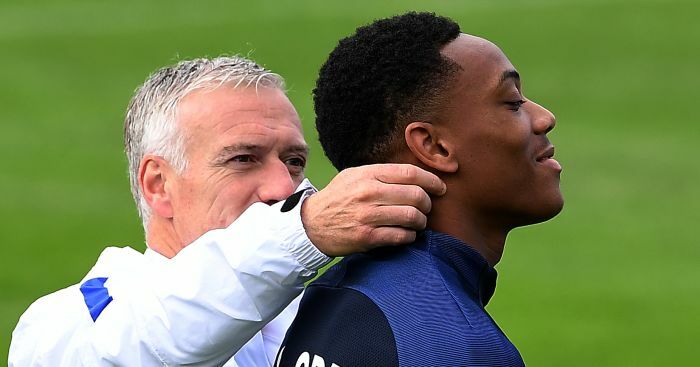 Martial has scored six goals in 13 games in all competitions this season and could add to his 18 France appearances when Deschamps' men go up against Netherlands and Uruguay later this month. "MANCHESTER UNITED A MUCH BETTER TEAM WITHOUT LUKAKU"